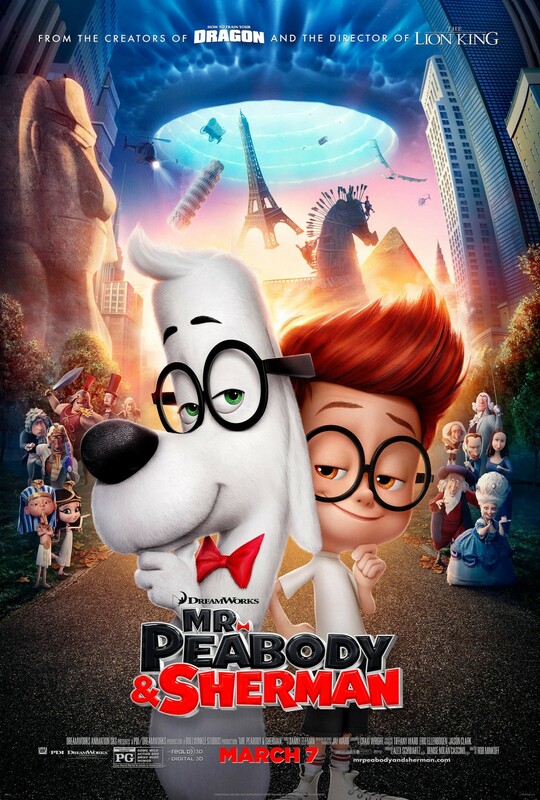 This big screen adaptation of Mr. Peabody & Sherman, about a supersmart dog and his adopted human son, is far from great, but it’s charming and very funny at times. Director Rob Minkoff and his team offer a pleasingly retro-style contemporary Manhattan and historical settings, from ancient Egypt to the french revolution. When 7 year old Sherman bites his classmate Penny (Ariel Winter) on his first day of school, a social worker (Allison Janney) tries to take the boy away from Mr. Peabody (Ty Burrell, channeling Kelsey Grammer). To fix things, Peabody invites Penny’s parents over for dinner. Things go wrong when Sherman unwisely decides to take Penny for a ride in their time machine. The result is a movie that’s jam-packed with jokes, relatable story ingredients, and large-scale action, which is well-staged in 3-D. I don’t think kids will have a chance to get bored. I admit: other Dreamworks movies had more charm and more soul. But there’s enough merry mischief here to satisfy, even if you’re an adult.